Over the years the attorneys at Jones Law Firm have recovered over 100 million dollars in unpaid wages on behalf of their clients. As true trial lawyers, we are among a group of a select few attorneys who have actually tried an employment-related overtime class action case. We have successfully litigated numerous multi-million dollar wage and hour class actions against some of the largest corporations including Taco Bell, Wells Fargo, Sears, Staples, Office Depot, Goodyear, Wingfoot, Pilot Travel, Circle K, Enterprise Rent a Car, Stations Casinos and other major Nevada Casinos, to name a few. Charles A. Jones primarily practices civil litigation with a particular emphasis on class action litigation and is the owner/founder of Jones Law Firm. Mr. Jones began his legal career as an associate with the Reno based law firm of Laxalt & Nomura. During his four years with Laxalt & Nomura, Mr. Jones represented hundreds of clients in general civil litigation matters. During this time, Mr. Jones successfully defended multiple clients in numerous civil jury trials, as well as over 35 arbitrations. In 2003, Mr. Jones devoted his practice almost exclusively to representing employees in wage and hour related class action law suits. He has successfully represented tens of thousands of class members in class action litigation in both state and federal courts in Nevada, California, Colorado and New York alleging violations of federal and/or state wage and hour laws on the issues of misclassification of employees as exempt from overtime laws, unpaid overtime compensation, meal and rest break violations, unpaid vacation pay, final payments at time of termination, uncompensated off-the-clock compensation, rounding of employee work time, and minimum wage violations. Mr. Jones routinely litigates wage and hour related class action cases against some of the nation’s largest corporations, including, Wal-Mart, Taco Bell, Wells Fargo, Sears, Staples and Office Depot. Mr. Jones has also successfully represented thousands of Nevada workers in wage and hour class actions against various casinos in Nevada. Mr. Jones has handled over twenty-five (25) class action cases on the areas noted above. Additionally, he has been appointed lead or co-lead plaintiffs’ class counsel in more than ten (10) certified class actions. Mr. Jones is knowledgeable in all aspects of complex class action litigation, including conducting class-wide discovery, obtaining contact information for putative class members prior to class certification, obtaining class certification, defeating motions to decertify certified classes, trying class action cases using random statistical sampling techniques, and proving class-wide damages. Mr. Jones is among a select few attorneys who has actually tried an employment-related wage and hour class action. Specifically, Mr. Jones was lead trial counsel in Puchalski v. Taco Bell Corp. The trial of the Puchalski class action, an overtime exemption misclassification case, lasted for four months and resulted in the Plaintiff class calling over thirty (30) class members witnesses at trial. The Puchalski case settled during its fourth month of trial for $20,000,000. 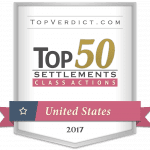 The settlement achieved in the Puchalski case resulted in the class members receiving one of the highest dollar-per-work-week settlements to date in an overtime misclassification case involving the executive exemption. Born in Coeur d’ Alene Idaho in 1973, Mr. Jones received his Bachelor of Arts in Political Science from the University of Puget Sound in 1994. Mr. Jones attended law school at the University of San Diego School of Law. Mr. Jones was a member of the national moot court team for the University of San Diego School of Law and graduated in the top third of his class. Mr. Jones received his law degree from the University of San Diego School of law in 1998. Mr. Jones is admitted to practice law in both state and federal courts in the following jurisdictions: Nevada, California, Colorado and New York. Mr. Jones is also admitted to practice before the U.S. Court of Appeals, Ninth Circuit. Kelly McInerney was born and raised in San Diego, California. She graduated from Vanderbilt University in 1995 and from the University Of San Diego School Of Law in 1998. She passed the California bar in 1998 and the Nevada bar in 1999. Since 1998, she has practiced class action law almost exclusively, with the great majority of that time spent litigating labor and employment actions on behalf of employees, as well as some civil fraud cases. She has been lead or co-lead counsel in over 25 class actions over the past 15 years. Those cases have settled or resulted in judgments exceeding $50 million dollars.